This Order was founded by Pope Gregory XVI., on the 1st September, 1831. It is worn suspended by a red ribbon with yellow borders by the Knights of the Grand Cross, across the right shoulder towards the left hip, together with the star (No. 1), on the left breast ; by the Commanders round the neck, without the star; and by the Knights in a smaller form at the button-hole. 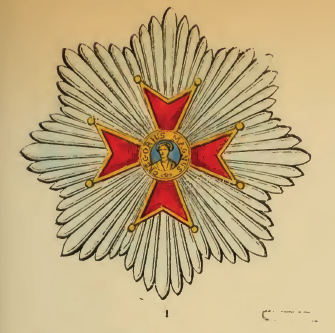 For civil service, the Cross is appended to a green enamelled olive branch (No. 2), and for mihtary service, it is adorned with golden trophies (No. 3), and sometimes, by special favour, with brilliants. There is no particular costume in connection with the Order.